It’s finally time for the London Olympics. As Adweek notes, most Olympic commercials tend to be serious, like “Best Job”, a great ad which I never wrote about for some reason. But serious isn’t in Old Spice’s brand identity. I feel like it’s harder to do great work that’s humorous, but Old Spice really excels in this aspect. Those are some manly premium table crackers! I’ve seen this Head & Shoulders commercial starring Minnesota Twins catcher/designated hitter/first baseman Joe Mauer many times over the last few months. And I always wondered the identity of the pretty fan that Joe talked to while waiting for a presumably very high pop-up. Well, now I know. It’s Tracy Weiler. Mystery solved! Filed under Uncategorized Tagged with Head & Shoulders, Joe Mauer, Procter & Gamble, Shampoo, Tracy Weiler, Who is that hot ad girl? As Terry Crews says, Old Spice is so powerful that it sells itself in other people’s commercials. Now THIS is why I (and so many others) want to get into copywriting. 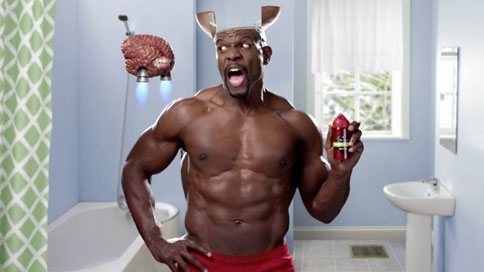 Old Spice has a new ad featuring old spokesman Terry Crews. It’s hilarious, though you might be grossed out if you’re one of those easily offended types. If you’re one of those easily offended types, you should buck up, because this is awesome. Apparently the Wieden+Kennedy campaign will extend past Old Spice, with Terry Crews making appearances in Procter & Gamble co-branded spots for Bounce and Charmin. I’m looking forward to it.